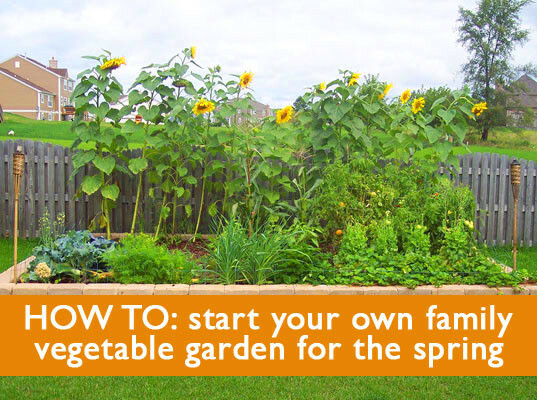 Starting your own family garden is easy, and it’s a wonderful way to time with your kids outside planning, planting, tending, and enjoying the benefits of your garden. Whether you have a big backyard, several containers on your apartment terrace or a plot in your community garden, the garden you grow together will yield more than fresh vegetables for dinner — you’ll reap lots of special moments and photo opportunities with your kids, too. As you decide what to plant and while you dig holes for the seeds, you can teach your kids lessons about why plants are important and how they grow. Your kids will love watching the garden grow from seeds and dirt into full, lush plants, and finally dinner for the whole family! Follow our five steps and you’ll have a garden worth showing off in no time. To start your garden you’ll need some basic supplies — shovels, rakes, hoes, gardening gloves and gardening gloves. Depending on the type of garden you choose you may also need soil and pots. If you’re crafty, you can make your own watering can from an old milk jug using our easy how-to instructions. To get kids extra excited for all of the gardening ahead, also choose a few supplies sized just for them. 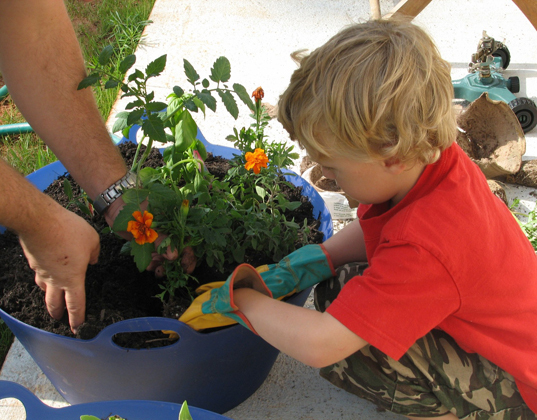 Even a kid-friendly gardening book may help your child take a greater interest in the project. If you have a big backyard, finding a patch to dedicate to a garden may be easy, but you don’t have to live in the burbs to have a garden. If you only have a small or shared backyard even a tiny patch of earth is enough to start your family’s first garden. Or go for a container garden by gathering several large terra cotta pots and designating each one for a different vegetable. No outdoor space for containers either? Find a community garden where you can secure a small plot of land for you and your family to visit and tend to every weekend. 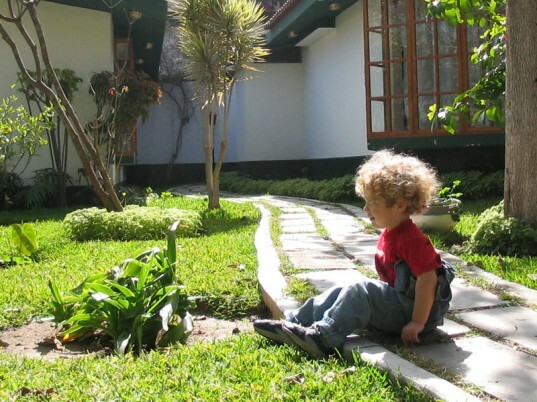 Once you do find the perfect spot for your family garden be sure to take a “before” photo of the space — your kids will love comparing the finished, blooming, in a few days, weeks, and months to watch how the garden grows. To ensure your garden is successful and your plants thrive, you’ll want to choose the right seeds for your location. Luckily, the seed-selling vendors at your neighborhood farmer’s market and gardening center will be able to offer advice on which vegetables will grow best in the local climate and the type of garden you’re creating. 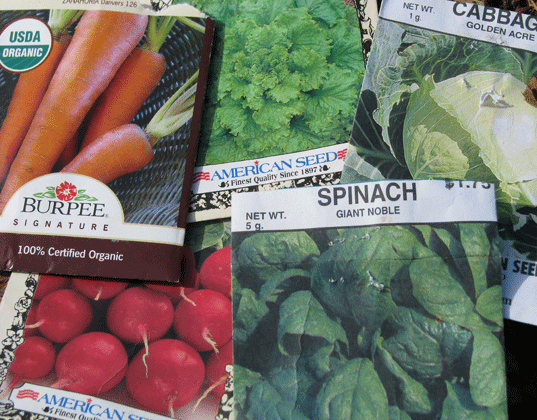 Before you go to purchase seeds, do some planning. Monitor the space you’ve set aside to see how much sun and shade it gets throughout the day. You might even want to bring a photo of the space when you go shopping so you can show the experts exactly what you’re working with. Also, think about what types of vegetables your family enjoys eating, and how much work you can put into your garden. Tomatoes, radishes, green beans, and sweet peppers are typically easy to grow, while cauliflower and corn can be more of a challenge. And while you can certainly start from seeds, there’s no harm in buying a few pre-grown seedlings to speed up the process. If your child picks a favorite plant that she’s particularly excited about, take a photo of her with her seed packet, and later capture a video of her planting her special pick. 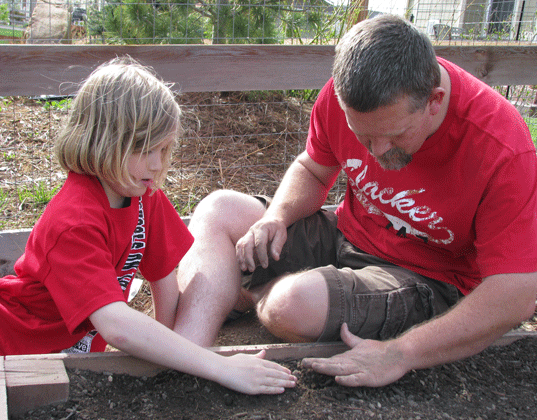 Planting your seeds or seedlings is the most exciting part of gardening for kids. Not only do they get a free pass to get messy and dig around in the dirt, but also, they’ll be excited to see how the plants grow after they’ve been planted. Set aside a whole afternoon to planting the garden and make it a celebratory day. 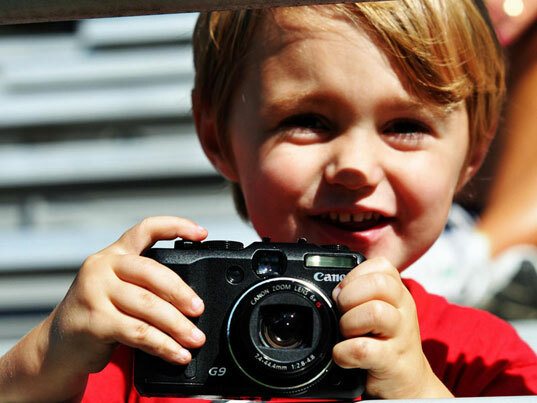 Take lots of photos of your little green thumbs digging, planting, watering, and proudly showing off their new garden — you’ll love these sweet memories later. Also, be sure to label each row of vegetables as you plant and take pictures of each one so you’ll be able to track the growth progress with your kids. They’ll love pulling up all the images on the computer and talking about the changes from week to week. Gardening is much more than the initial planting. Teach your kids the importance of caring for your garden, and that if you don’t put in the time, you won’t get the satisfaction of gorgeous successful vegetables as a result. Try to explain that tending to the garden can be a relaxing experience, and a nice way to spend time as a family getting closer to the earth. Take lots of photos as your garden grows. Your kids will love looking back at the major changes that have happened — from dirt, to sprout, to seedling, to bud, and finally a vegetable! 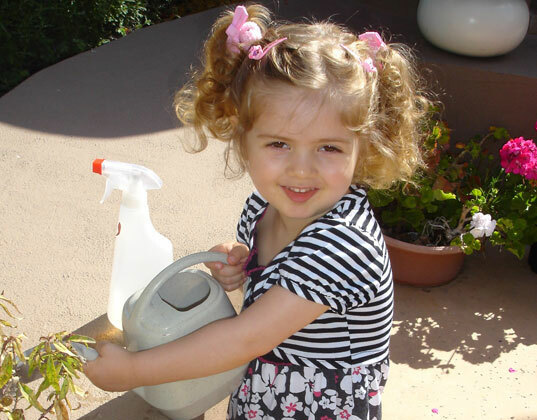 Give your children special tasks — watching for and pulling out weeds, checking the soil to see if it needs to be watered, watering the plants, and checking for any signs of buds. Be sure to read up on each type of vegetable you’re planting since they all need slightly different care. Once vegetables start coming in you also want to make sure you’re picking them at just the right time — tomatoes for example shouldn’t be taken off the vine when they’re too orange, but if you leave be too long they’ll get overripe and attract hungry birds! To make your garden more special and memorable, start garden traditions this year that will live on for years to come. For example, have a biggest vegetable contest. As the veggies get bigger and bigger, your child can monitor their size. Do you have the biggest head of lettuce you’ve ever grown or the longest zucchini? Once your child chooses the best veggie of the year, take their photo with the prized vegetable. Another idea is to host a garden party for your child and her friends. You can hold a party at the end of the growing season, so everyone can taste the veggies you’ve worked so hard to grow all summer. Serve them raw, or prepare some delicious recipes with your child. No matter what you serve, you’ll have plenty of opportunities to snap sweet photos of the kids eating, sharing and smiling in the garden. I'll have to try this with my munchkin! This looks like a blast!! I'm going to have to get digging in the backyard! I don't have a kid but I'll def try this with my cats! When I was a kid we ALWAYS had a huge vegetable garden and I think it contributed to my non-picky-eaterness. I love all foods, especially those I can pick and eat right out of the ground, all kids should have that experience! We always had a family garden when I was growing up -- so much fun for kids and adults! We'll be planting a vegetable garden this year... for the deer. They requested lettuce. I have wonderful memories of gardening with my dad in the summertime. I now have my own garden and definitely have him to thank for that. There's nothing quite like making dinner with veggies you've grown with your family. A great way to get kids excited about eating green too! An eco-friendly/money saving point to add - if you only have room for a tiny garden, grow something organic that you eat all the time. For example, we eat a ton of bell peppers at my house, which are SUPER expensive in organic form. Growing just a big pot of peppers can save us a bundle. So, if you're conflicted about what to grow, aim for growing the most expensive organics from the store because it's a great way to save money. Great article! My daughter LOVES being outdoors, watering plants and gardening- which plants the metaphorical seeds of taking care of our earth and realizing the work farmers do to grow our food. I think kids are more apt to eat the veggies they helped grow as well! Starting your own family garden is easy, and it's a wonderful way to time with your kids outside planning, planting, tending, and enjoying the benefits of your garden. Whether you have a big backyard, several containers on your apartment terrace or a plot in your community garden, the garden you grow together will yield more than fresh vegetables for dinner -- you'll reap lots of special moments and photo opportunities with your kids, too. As you decide what to plant and while you dig holes for the seeds, you can teach your kids lessons about why plants are important and how they grow. Your kids will love watching the garden grow from seeds and dirt into full, lush plants, and finally dinner for the whole family! Follow our five steps and you'll have a garden worth showing off in no time.